It’s raining business conferences at this time of the year, and the NASSCOM Product Conclave is easily one of our favourites. They put out great content and curate an exciting list of speakers year after year. This year they have the likes of Sriram Rajamani, Atul Satija, and Shekhar Kirani, and we are looking forward to their sessions. The Conclave also provides opportunities to meet industry leaders in person and, if the chance presents itself, to talk shop with them. Most of the leaders are willing to give ear, and you could also win an endorsement from them (assuming your business or product excites them). Also, the quality of participants increases the likelihood of meeting your future co-founders and initiating successful partnerships at NPC. 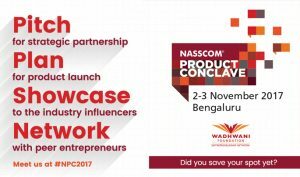 In addition to building partnerships and finding target customers, you can also engage with mentors at the NASSCOM Product Conclave (NPC) 2017. Register early at NPC’s Business Connects. Identify your key business challenges well in advance to ensure you articulate your business needs clearly to mentors. This will help the mentor to give you the right insights. Make a list of speakers that interest you or are relevant to your business. Attend their sessions at the Nasscom Product Conclave (NPC), and most often than not you’ll find some information that resonates with you. Use this as your opening lines while connecting with the speaker either at the event or later on LinkedIn or at other events. Have a 30-second pitch of your product or startup ready with a demo on your phone. Like most business conferences, NPC runs parallel sessions while participants network outside the halls. Don’t let the intense activities to get the better of you; study the agenda in advance and make a list of events that you want to attend. Dedicate the rest of the time to connect with fellow participants or to check out the stalls or product showcases. Immerse yourself into the conference by listening, networking and looking out for new trends. Be open to new ideas and perspectives. You’ll come across serendipitous connects that could open doors for your business or products. You’ll meet influencers who can create a positive impact for your business through an endorsement or introduction to relevant partners. Create a follow-up plan after the event and engage them with them through email or Inmail and follow up with a telephonic call. Be direct in your asks and ensure it resonates with their focus areas. Have a fantastic time at NPC 2017 and don’t forget to connect with us at @nenindia. We will be live tweeting at the event and would love to hear about your venture.